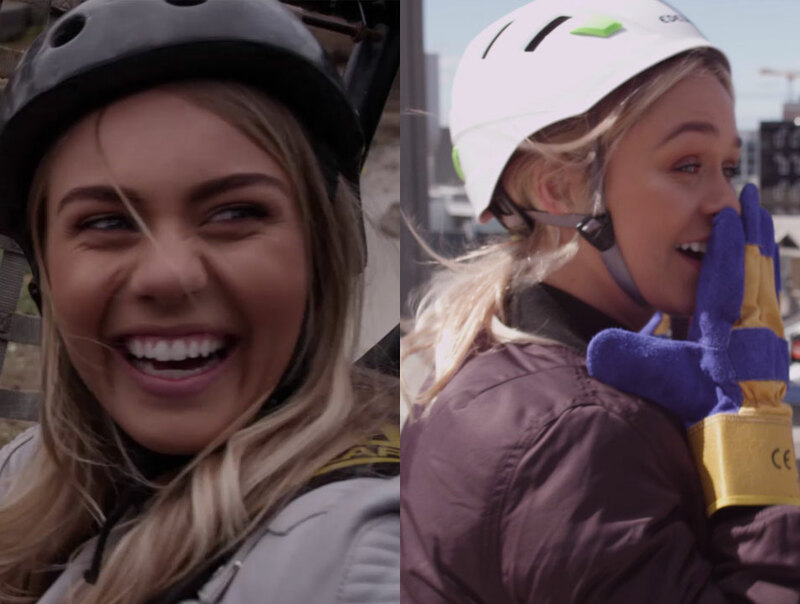 To celebrate the release of Nerve on Blu-Ray, DVD and Digital, The Fashion Spot have partnered with Village Roadshow to throw dares to two of Australia’s most exciting young models. Starring big-name Hollywood stars Dave Franco and Emma Roberts, the thrilling plot of Nerve revolves around a high-stakes truth or dare game where players must perform dangerous deeds while watchers pay to observe. So we threw a challenge out to a pair of Aussie models; Elyse Knowles and Michaela Wain, to participate in our own little game of truth or dare (but without the truth). First up we dared Elyse to get outside her comfort zone and head out to a 4×4 buggy course to see if she could take the heat and make it around the challenging treacherous course. Next up, we challenged Michaela to do some unconventional abseiling; forwards down a tall building. Ooft. The girls handled themselves admirably and with the poise you’d expect, with both Elyse and Michaela overcoming their fear and proving they’ve both got plenty of Nerve. ‘Nerve’, new to buy or rent on Blu-ray, DVD & Digital. Industrious high school senior, Vee Delmonico [Emma Roberts], has had it with living life on the sidelines. When pressured by friends to join the popular online game Nerve, Vee decides to sign up for just one dare in what seems like harmless fun. Buy Here.